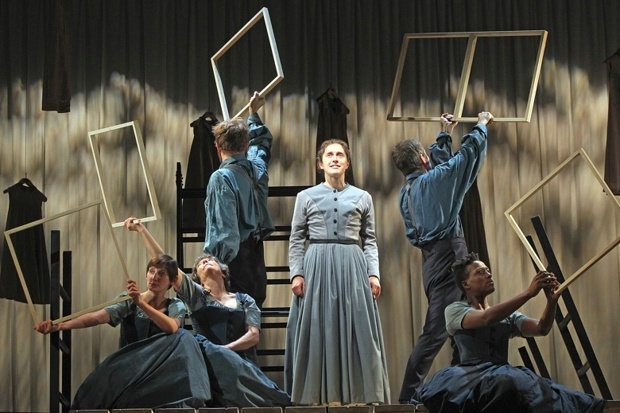 The first reviews of Sally Cookson's Jane Eyre at the National Theatre are now being published. The Stage gives it 5 stars out of 5. Even in this (relatively) condensed version, room is given to the parts of the novel usually skimmed over: to Jane’s childhood in particular, and the events that make and shape her – the terror of the red room, the cruelties of Lowood, the death of poor Helen Burns. The staging is full of inventive touches. Michael Vale’s spare, curtained set is superbly versatile, with a series of platforms and ladders suggesting Thornfield and Aideen Malone’s lighting adding texture and colour. Benji Bower’s atmospheric music is also central to the feel of piece. Though she doesn’t entirely avoid the difficulties inherent in playing Jane as a child, Madeleine Worrall is captivating, capturing Jane’s self-knowledge and freedom of mind, her strength and spirit; Felix Hayes is everything you want in a Rochester: brusque, difficult, prickly, but also massively charismatic and in possession of a rich, rolling voice. But as good as they both are, this is very much an ensemble piece,the company working tightly together to create the world of the play. It is also one of The Stage's theatre picks. The Daily Mail also gives it 5 stars out of 5. Director Sally Cookson and her cast of ten did not start with a script. They themselves ‘devised’ the story’s telling. An essay in the programme begins to explain this, yet it sounds pretty daunting: right up to the last few rehearsals, they were dropping scenes, inserting new touches, experimenting and multi-role playing. I know, I know, it sounds precious and irritating. So may the set: pale planks and a central, very basic platform with a few different levels, ladders and iron bars. Right in the middle is a small band, which plays jazzy, folky songs and provides backing music, while the actors convey things such as the clattering journey of a horse-drawn coach. Madeleine Worrall’s Jane is a short, plucky Northerner, neither too pretty (quite right) nor too bold. Bronte wrote of her sense of entrapment and here she pushes open a window frame which has been placed before her by other actors — and as she does so there is a burst of wind and a fluttering of bird feathers to signify her dream of freedom. Felix Hayes’s Rochester is not exactly posh but he certainly lives ‘on the crater-crust’ and knows that life might spew fire at him at any moment. He is impulsive, direct beyond the point of rudeness — a volcano himself. Rochester: ‘A true Jane-ian reply!’ The modern idiom does not sound at all odd because director Cookson has managed to plant us in a completely different zone from that of normal costume drama. And yet this is a show with corsets and smocks and a bath chair. The cast themselves offer us a script that emerges largely from Brontë’s own text (with some conscious diversions), a spoken scaffolding for the real business of the evening which is all physical. This is not Complicite; text still stands alone, but it is amplified by gestures and devices – physical doubling (and trebling), spoken sound-effects, slow-motion movement, infinite cast shifting, animals and even inanimate objects brought to life – that help grease the wheels of this breathless drama. While it’s hard to fault the energy and flexibility of the cast, led by Madeleine Worrall’s Jane – staunch, fiery, tracing the character from uncontrolled childhood passion to adult interiority – there are inevitably losses as well as gains with such a reworking. The latter include a potently expanded Bertha Mason (Melanie Marshall, pictured left), given in song what she is denied in speech, Felix Hayes’s dominant Rochester and lovely touches like Craig Edwards’ indefatigable Pilot (Rochester’s dog) and Benji Bower’s luminous score, stitching this fragmented drama together. The former, however, would have to acknowledge a little too much melodrama – verging on the mawkish – in the early episodes (a problem dealt with by the book’s first-person narrator, growing from youthful excess to more mature reflection), and pacing that takes a while to settle. Charlotte Brontë’s iconic masterpiece Jane Eyre will be performed by Northern Ballet next year to mark the bicentennial anniversary of the author’s birth. Yorkshire Evening Post and The Bucks Herald echoes the news. Starring Ruth Wilson and Toby Stephens. This is my favourite portrayal of Jane Eyre so far. If Jane Eyre was a real person and alive now I imagine her as some sort Lana del Ray figure or as a sassy spoken word performer. She is the ultimate proto feminist. This version sticks very close to Charlotte Bronte’s novel and Ruth Wilson is amazing in it. Jane Eyre is an orphan who has the most miserable of upbringings as you can get. As soon as she comes of age she escapes the school that has been her home for so long. She gets a job as a governess at Thornfield Hall. Enter the master of the estate, the grumpy Mr Rochester played by the brilliant Toby Stephens. They strike up the unlikeliest of bonds and then ensues the classic will they won’t they story love story. Yet It’s more than just a romantic story, it’s a journey of a strong young woman who refuses to be anybody but herself. Wilson captures the strength and independence of her character without making it unbelievable for the time. Spanish writer Ángeles Caso and her book Todo ese fuego are featured on the radio programme Las mañanas de RNE and Diario de Mallorca. Writer Colleen Morrissey sounds like a Brontëite in this interview from The Southeast Review. Is there a certain writer or piece of writing you find yourself turning to over and over again? Wuthering Heights by Emily Brontë. It’s my favorite book of all time, and it’s got everything. I have no idea how a writer can fit the entire universe into a relatively short novel like that, but she did. This article highlights what's to be found at Emory University's Manuscript, Archives, and Rare Book Library, which includes a few Brontë treasures (also on Fine Books & Collections). The Telegraph and Argus suggests a walk that passes through Wycoller and its Brontë connection is mentioned. A Brontëan encounter on The Sisters' Room (in Italian). The latest Brontë Society newsletter can be read here.